A map of Europe showing the continent's monarchies (red) and republics (blue). Republicanism became more prevalent in the Early Modern period, but monarchy remained predominant in Europe during the 19th century. Since the end of World War I, however, most European monarchies have been abolished. There remain, as of 2016, twelve (12) sovereign monarchies in Europe. Of these, seven are kingdoms: Denmark, Norway and Sweden and the United Kingdom of Great Britain and Northern Ireland are of pre-modern origin; the kingdoms of the Netherlands and of Belgium were established in 1815 and 1830, respectively; the Kingdom of Spain, founded in 1479, was abolished in 1931, restored in 1947/69, before Spain transitioned to democracy in 1978 as a constitutional monarchy. The principalities of Andorra, Liechtenstein, and Monaco and the Grand Duchy of Luxembourg were restored as sovereign states in the aftermath of the Napoleonic Wars. The State of the Vatican City was recognized as a sovereign state administered by the Holy See in 1929. The notion of kingship in Europe ultimately originates in systems of tribal kingship in prehistoric Europe. The Minoan (c. 3200 – c. 1400 BCE) and Mycenaean civilisation (c. 1600 – c. 1100 BCE) provide the earliest examples of monarchies in protohistoric Greece. Thanks to the decipherment of the Linear B script in 1952, much knowledge has been acquired about society in the Mycenaean realms, where the kings functioned as leaders of palace economies. The role of kings changed in the following Greek Dark Ages (c. 1100 – c. 750 BCE) to big gentleman farmers with military power. The Pnyx, as meeting place the heart of Athenian democracy. Since the beginning of antiquity, monarchy confronted several republican forms of government, wherein executive power was in the hands of a number of people that elected leaders in a certain way instead of appointing them by hereditary succession. During the archaic period (c. 750–500 BCE), kingship disappeared in almost all Greek poleis, and also in Rome (then still a barely significant town). After the demise of kingship, the Greek city-states were initially most often led by nobility (aristocracy), after which their economic and military power base crumbled. Next, in almost all poleis tyrants usurped power for two generations (tyranny, 7th and especially 6th century BCE), after which gradually forms of governments led by the wealthy (oligarchy) or assemblies of free male citizens (democracy) emerged in Classical Greece (mainly after 500 BCE). Athenian democracy (6th century–322 BCE) is the best-known example of the latter form; classical Sparta (c. 550–371 BCE) was a militaristic polis with a remarkable mix between monarchy (dual kingship), aristocracy (Gerousia) and democracy (Apella); the Roman Republic (c. 509–27 BCE) had a mixed constitution of oligarchy, democracy and especially aristocracy. Macedonian king Philip II united all Greek poleis under his crown in 338 BCE. The dominant poleis of Athens and Sparta were weakened by warring each other, especially during the Peloponnesian War (431–404 BCE) won by Sparta. They were defeated and ruled by Thebes for a time (371–360 BCE), after which Sparta's role was over. Eventually, all of Greece was subjugated by the Macedonian monarchy in 338 BCE, that put an end to the era of free autonomous city-states, and Athenian democracy as well in 322 BCE. In the subsequent Hellenistic period (334–30 BCE) numerous diadochs (successors of Alexander the Great) fought one another for the kingship of Macedon, definitively obtained by the Antigonids in 277 BCE. Meanwhile, the Phoenician city-state of Carthage, located in present-day Tunisia, aside from settling large swaths of North Africa's coast, also set up several colonies on Sicily, Sardinia, Corsica, the Baleares and in southern Iberia. The Carthaginian empire, according to tradition founded in 814 BCE, started out as a monarchy, but in the 4th century transformed into a republic where suffets ("judges") ruled. Finally, Rome gradually conquered all of Italy (primarily after 350 BCE), and defeated Carthage in the Punic Wars (264–146 BCE). In 168, Macedon was subdued by the Romans, and partitioned into four client republics. These were annexed as Roman provinces in 148, as happened to Greece in 146, making Rome's territory envelop all of literate Europe. The remainder of Iberia, the Illyrian coast and eventually Gaul by general Julius Caesar were added to the Roman Republic, which however was experiencing an institutional crisis. After defeating his rival Pompey, Caesar was appointed dictator to restore order. He almost managed to found a dynasty in the process, but was killed by a republican cabal led by Brutus in 44 BCE. The first Roman Emperor, Augustus (r. 27 BCE–14 CE). Caesar's adoptive son Octavian prevailed in the ensuing civil war, and converted the Roman Republic into the Roman Empire in 27 BCE. 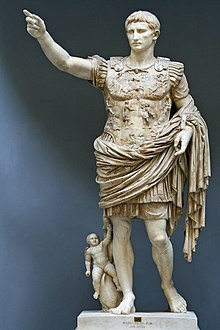 He took on the name Augustus, with the rather humble title of princeps ("first [citizen]"), as if he were merely primus inter pares ("first among equals"), when he had in fact founded a monarchy. This limited emperorship (Principate) was strengthened in 284 by Diocletian to absolute reign (Dominate). The Empire recognised various client kingdoms under imperial suzerainty; most of these were in Asia, but tribal client kings were also recognized by the Roman authorities in Britannia. Most of the barbarian kingdoms established in the 5th century (the kingdoms of the Suebi, Burgundi, Vandals, Franks, Visigoths, Ostrogoths) recognized the Roman Emperor at least nominally, and Germanic kingdoms would continue to mint coins depicting the Roman emperor well into the 6th century. It was this derivation of the authority of kingship from the Christian Roman Empire that would be at the core of the medieval institution of kingship in Europe and its notion of the divine right of kings, as well as the position of the Pope in Latin Christendom, the restoration of the Roman Empire under Charlemagne and the derived concept of the Holy Roman Empire in Western Europe. The monarchies of Europe in the Christian Middle Ages derived their claim from Christianisation and the divine right of kings, partly influenced by the notion of sacral kingship inherited from Germanic antiquity. The great powers of Europe in the Early Modern period were the result of a gradual process of centralization of power taking place over the course of the Middle Ages. The Early Middle Ages begin with a fragmentation of the former Western Roman Empire into "barbarian kingdoms". 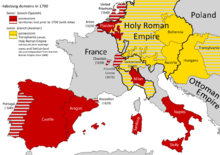 In Western Europe, the kingdom of the Franks developed into the Carolingian Empire by the 8th century, and the kingdoms of Anglo-Saxon England were unified into the kingdom of England by the 10th century. With the breakup of the Carolingian Empire in the 9th century, the system of feudalism places kings at the head of a pyramid of relationships between liege lords and vassals, dependent on the regional rule of barons, and the intermediate positions of counts (or earls) and dukes. The core of European feudal manorialism in the High Middle Ages were the territories of the kingdom of France, the Holy Roman Empire (centered on the nominal kingdoms of Germany and Italy) and the kingdoms of England and Scotland. The House of Habsburg became the most influential royal dynasty in continental Europe by the 17th century, divided into the Spanish and Austrian branches. The modern resurgence of parliamentarism and anti-monarchism began with the temporary overthrow of the English monarchy by the Parliament of England in 1649, followed by the American Revolution (1775–83) and especially the French Revolution (1789–99). The absolutist Kingdom of France was first transformed to a constitutional monarchy (1791–92), before being fully abolished on 21 September 1792, and eventually the former king even executed, to the other European courts' great shock. During the subsequent French Revolutionary Wars (1792–1799), the great European monarchies were unable to restore the monarchy; instead, the French First Republic expanded and annexed neighbouring territories, or converted them into loyal sister republics. Meanwhile, the German Mediatization of 1803 thoroughly rearranged the political structure of the Holy Roman Empire, with many small principalities and all ecclesiastical lands being annexed by larger monarchies. After Napoleon seized power, however, he gradually constructed a new imperial order in French-controlled Europe, first by crowning himself Emperor of the French in 1804, and then converting the sister republics into monarchies ruled by his relatives. Following Napoleon's defeat in 1814 and 1815, the reactionary Congress of Vienna determined that all of Europe should consist of strong monarchies (with the exception of Switzerland and a few insignificant republics). In France, the Bourbon dynasty was restored, replaced by the liberal July Monarchy in 1830, before the entire monarchy was again abolished during the Revolutions of 1848. The popular Napoleon III was able to proclaim himself Emperor in 1852, thus founding the Second French Empire. The kingdoms of Sicily and Naples ("Two Sicilies") were absorbed into the kingdom of Sardinia to form the Kingdom of Italy in 1861. Austria and Prussia vied to unite all German states under their banner, with Prussia emerging victorious in 1866. It succeeded in provoking Napoleon III to declare war, defeat France and absorb the southern German states into the German Empire in the process (1870–71). From the ashes of the Second Empire rose the French Third Republic, the only great republican European power until World War I. Much of 19th century politics was characterised by the division between anti-monarchist Radicalism and monarchist Conservativism. The Kingdom of Spain was briefly abolished in 1873, restored 1874–1931 and again in 1978. The Kingdom of Portugal was abolished in 1910. The Russian Empire ended in 1917, the Kingdom of Prussia in 1918. The Kingdom of Hungary fell under Habsburg rule in 1867 and was dissolved in 1918 (restored 1920–1946). Likewise, the Kingdom of Bohemia under Habsburg rule was dissolved in 1918. Many countries abolished the monarchy in the 20th century and became republics, especially in the wake of either World War I or World War II. Emmanuel Macron[I] 21 December 1977 41 y. 14 May 2017 None; successor elected in the next French presidential election. I^ The co-prince of Andorra is also the president of France. II^ Leonor is, as the reigning king's older daughter, the current heiress presumptive. Felipe VI has no sons. III^ The monarch of the United Kingdom is also the sovereign of the fifteen other Commonwealth realms. Andorra has been a co-principality since the signing of a paréage in 1278, when the count of Foix and the bishop of La Seu d'Urgell agreed to share sovereignty over the landlocked country. After the title of the count of Foix had been passed to the kings of Navarre, and after Henry of Navarre had become Henry IV of France, an edict was issued in 1607 which established the French head of state as the legal successor to the count of Foix in regard to the paréage. Andorra was annexed by the First French Empire together with Catalonia in 1812–1813. After the Empire's demise, Andorra became independent again. The current joint monarchs are Bishop Joan Enric Vives Sicília and President Emmanuel Macron of France. Belgium has been a kingdom since 21 July 1831 without interruption, after it became independent from the United Kingdom of the Netherlands with Léopold I as its first king. Belgium is the only remaining popular monarchy in the world: The monarch is formally known as the "King of the Belgians", not the "King of Belgium". While in a referendum held on 12 March 1950, 57.68 percent of the Belgians voted in favor of allowing Léopold III, whose conduct during World War II had been considered questionable and who had been accused of treason, to return to the throne; due to civil unrest, he opted to abdicate in favor of his son Baudouin I on 16 July 1951. The current monarch is Philippe. In Denmark, the monarchy goes back to the prehistoric times of the legendary kings, before the 10th century and the Danish monarchy is the oldest in Europe. Currently, about 80 per cent support keeping the monarchy. The current monarch is Margrethe II. The Danish monarchy also includes the Faroe Islands and Greenland which are parts of the Kingdom of Denmark with internal home rule. Due to this status, the monarch has no separate title for these regions. Liechtenstein formally came into existence on 23 January 1719, when Charles VI, Holy Roman Emperor decreed the lordship of Schellenberg and the countship of Vaduz united and raised to the dignity of a principality. Liechtenstein was a part of the Holy Roman Empire until the Treaty of Pressburg was signed on 26 December 1805; this marked Liechtenstein's formal independence, though it was a member of the Confederation of the Rhine and the German Confederation afterwards. While Liechtenstein was still closely aligned with Austria-Hungary until World War I, it realigned its politics and its customs and monetary institutions with Switzerland instead. Having been a constitutional monarchy since 1921, Hans-Adam II demanded more influence in Liechtenstein's politics in the early 21st century, which he was granted in a referendum held on 16 March 2003, effectively making Liechtenstein a semi-constitutional monarchy again. However, the constitutional changes also provide for the possibility of a referendum to abolish the monarchy entirely. The current monarch is Hans-Adam II, who turned over the day-to-day governing decisions to his son and heir Alois, Hereditary Prince of Liechtenstein on 15 August 2004. Luxembourg has been an independent grand duchy since 9 June 1815. Originally, Luxembourg was in personal union with the United Kingdom of the Netherlands and the Kingdom of the Netherlands from 16 March 1815 until 23 November 1890. While Wilhelmina succeeded Willem III in the Netherlands, this was not possible in Luxembourg due to the order of succession being based on Salic law at that time; he was succeeded instead by Adolphe. In a referendum held on 28 September 1919, 80.34 per cent voted in favor of keeping the monarchy. The current monarch is Henri. Monaco has been ruled by the House of Grimaldi since 1297. From 1793 until 1814, Monaco was under French control; the Congress of Vienna designated Monaco as being a protectorate of the Kingdom of Sardinia from 1815 until 1860, when the Treaty of Turin ceded the surrounding counties of Nice and Savoy to France. Menton and Roquebrune-Cap-Martin, part of Monaco until the mid-19th century before seceding in hopes of being annexed by Sardinia, were ceded to France in exchange for 4,000,000 French francs with the Franco-Monegasque Treaty in 1861, which also formally guaranteed Monaco its independence. Until 2002, Monaco would have become part of France had the house of Grimaldi ever died out; in a treaty signed that year, the two nations agreed that Monaco would remain independent even in such a case. The current monarch is Albert II. His descendants became de facto heads of state of the Dutch Republic during the 16th to 18th centuries, which was an effectively hereditary role. For the last half century of its existence, it became an officially hereditary role and thus a monarchy (though maintaining republican pretense) under Prince William IV. His son, Prince William V, was the last stadtholder of the republic, whose own son, King William I, became the first king of the United Kingdom of the Netherlands, which was established on 16 March 1815 after the Napoleonic Wars. With the independence of Belgium on 21 July 1831, the Netherlands formally became the Kingdom of the Netherlands. The current monarch is Willem-Alexander. Norway was united and independent for the first time in 872, as a kingdom. It is thus one of the oldest monarchies in the world, along with the Swedish and Danish ones. Norway was part of the Kalmar Union from 1397 until 1524, then part of Denmark–Norway from 1536 until 1814, and finally part of the Union between Sweden and Norway from 1814 until 1905. Norway became completely independent again on 7 June 1905. Support for establishing a republic lies around 20 per cent. The current monarch is Harald V.
Spain came into existence as a single, united kingdom under Charles I of Spain on 23 January 1516. The monarchy was briefly abolished by the First Spanish Republic from 11 February 1873 until 29 December 1874. The monarchy was abolished again on 14 April 1931, first by the Second Spanish Republic – which lasted until 1 April 1939 – and subsequently by the dictatorship of Francisco Franco, who ruled until his death on 20 November 1975. Monarchy was restored on 22 November 1975 under Juan Carlos I, who was also the monarch until his abdication in 2014. His son Felipe VI is the current monarch. The 1978 constitution confirms the title of the monarch is the King of Spain, but that he may also use other titles historically associated with the Crown, including the kingdoms of Castile and León, Aragon, the Two Sicilies, Jerusalem, Navarre, Granada, Seville, Toledo, Valencia, Galicia, Sardinia, Córdoba, Corsica, etc. Today, there is a large number of organisations campaigning in favor of establishing a Third Spanish Republic; Data from 2006 suggest that only 25 percent of Spaniards are in favor of establishing a republic; however, the numbers have increased since Juan Carlos I abdicated. Sweden’s monarchy goes back as far as the Danish one, to the semi–legendary kings before the 10th century, since then it has not been interrupted. However, the unification of the rivalling kingdoms Svealand and Götaland (consolidation of Sweden) did not occur until some time later, possibly in the early 11th century. The current royal family, the House of Bernadotte, has reigned since 1818. The current monarch is Carl XVI Gustaf. The monarchy of the United Kingdom can be defined to have started either with the Kingdoms of England (871) or Scotland (843), with the Union of the Crowns on 24 March 1603, or with the Acts of Union of 1 May 1707. It was briefly interrupted by the English Interregnum, with the Commonwealth of England existing in its stead from 30 January 1649 until 15 December 1653 and from 26 May 1659 until 25 May 1660 and the Protectorate taking its place from 16 December 1653 until 25 May 1659. The current monarch is Elizabeth II. Support for establishing a republic instead of a monarchy was around 18 per cent in the United Kingdom in 2006, while a majority thinks that there will still be a monarchy in the United Kingdom in ten years' time, public opinion is rather uncertain about a monarchy still existing in fifty years and a clear majority believes that the monarchy will no longer exist a century after the poll. Public opinion is, however, certain that the monarchy will still exist in thirty years. About 30 per cent are in favour of discontinuing the monarchy after Elizabeth's death. The monarch of the United Kingdom is also the monarch of the fifteen other Commonwealth realms, none of which are in Europe. Some of these realms have significant levels of support for republicanism. Differently from the Holy See, in existence for almost two thousand years, the Vatican City was not a sovereign state until the 20th century. In the 19th century the annexation of the Papal States by the Kingdom of Sardinia, and the subsequent establishment of the Kingdom of Italy, was not recognized by the Vatican. However, by the Lateran treaty of 1929, the Kingdom of Italy recognized Vatican City as an independent state, and vice versa. Since then, the elected monarch of the Vatican City state has been the current pope. The pope still officially carries the title "King of the Ecclesiastical State" (in Latin: Rex Status Ecclesiæ). The succession order is determined by primogeniture in most European monarchies. Belgium, Denmark, Luxembourg, the Netherlands, Norway, Sweden and the United Kingdom now adhere to absolute primogeniture, whereby the eldest child inherits the throne, regardless of gender; Monaco and Spain have the older system of male-preference primogeniture, while Liechtenstein uses agnatic primogeniture. In 1990, Norway granted absolute primogeniture to the Norwegian throne, meaning that the eldest child, regardless of gender, takes precedence in the line of succession. This was not, however, done retroactively (as, for example, Sweden had done in 1980), meaning that Haakon, Crown Prince of Norway continues to take precedence over his older sister. There are plans to change to absolute primogeniture in Spain through a rather complicated process, as the change entails a constitutional amendment. Two successive parliaments will have to pass the law by a two-thirds majority and then put it to a referendum. As parliament has to be dissolved and new elections have to be called after the constitutional amendment is passed for the first time, the previous Presidente del Gobierno José Luis Rodríguez Zapatero indicated he would wait until the end of his first term in 2008 before passing the law, although this deadline passed without the referendum being called. The amendment enjoys strong public support. To change the order of succession in the United Kingdom, as the Queen of the United Kingdom is also the queen of the fifteen other Commonwealth realms, a change had to be agreed and made by all of the Commonwealth realms together. In the United Kingdom, the Succession to the Crown Act 2013 was enacted, and after completion of the legislative alterations required in some other realms, the changes came into effect across the Commonwealth realms on 26 March 2015. Liechtenstein uses agnatic primogeniture (aka Salic law), which completely excludes women from the order of succession unless there are no male heirs of any kind present, and was criticised for this by a United Nations committee for this perceived gender equality issue in November 2007. The co-princes of Andorra are the president of the French Republic, who is elected by the French people, and the Bishop of La Seu d'Urgell, who is appointed by the Pope. The absolute monarch of Vatican City, the Pope, is elected by the College of Cardinals. The current ruler is Pope Francis. Luxembourg also used agnatic primogeniture until 20 June 2011, when absolute primogeniture was introduced. One issue that occasionally rises is whether the monarchies are too expensive when compared to republics, or whether particular monarchies are more expensive than others, to maintain. This comparison may be hard to draw, since financial administration may differ radically from country to country, and not all profits and costs are publicly known, and because of different arrangements regarding the private property of the monarch. In the UK, the Crown Estate has a special legal status making it neither government property nor the private property of the monarch. Revenues from these hereditary possessions have been placed at the disposition of the British government (thus proceeding directly to the Treasury) by every monarch since the accession of George III in 1760; the revenues of GBP 304.1 million (fiscal year of 2015/16) far exceed the expenses of the British royal family in this sense resulting in a "negative cost" of the British monarchy. In 2016, Dutch newspaper de Volkskrant published an overview of the annual expenditure (excluding security expenses) of all European royal houses (not counting Luxembourg and the four monarchical European microstates). Source: de Volkskrant (2016), based on the royal houses' websites of the seven monarchies, professor Herman Matthijs' 2013 study, the Dutch National Budget 2017, and ABCTOPConsult. The existence of subsidies to family members of the heads of state in some monarchies increases their expenses. He stressed that the financial administration's transparency differs enormously between countries; especially the non-transparent monarchies may be much more expensive than is publicly known. This means comparing them to republics, especially the very transparent administration of France where citizens can know exactly what they pay for, may be unfair. In a 2015 interview with NRC Handelsblad, Matthijs commented that the then-known €7.7 million allotted to the royal house in Spain's national budget was 'unbelievable': "I can't find out more, but I understand from the media that the total expenses of the Spanish house may be as much as 80 million." Source: Herman Matthijs, "De kosten van een staatshoofd in West-Europa" (2013). Calls for the abolition of Europe's monarchies have been widespread since the development of republicanism in the 17th to 18th centuries during the Enlightenment. During the French Revolution, the Ancien Régime in France was abolished, and in all territories the French First Republic conquered during the following Coalition Wars, sister republics were proclaimed. However, after Napoleon crowned himself Emperor of the French in 1804, all of these (except Switzerland) were converted back to monarchies headed by his relatives. The post-Napoleonic European Restoration reaffirmed the monarchical balance of power on the continent. In subsequent decades, republicanism would regain lost ground with the rise of liberalism, nationalism, and later socialism. The Revolutions of 1848 were largely inspired by republicanism. Most of Europe's monarchies were abolished either during or following World War I or World War II, and the remaining monarchies were transformed into constitutional monarchies. Republican movements in Europe remain active up to present. The most prominent organisations campaigning to eliminate one or more of Europe's remaining monarchies and/or to liquidate assets reserved for reigning families are affiliated with the Alliance of European Republican Movements, but there are smaller independent initiatives as well, such as Hetis2013 in the Netherlands. Also, some political parties (e.g. Podemos in Spain) have stepped up and called for national referenda to abolish monarchies. The political influence of monarchism in former European monarchies is very limited. The most influential such movement was Carlism in Spain, calling for the restoration of the Bourbon (rather than the Habsburg) dynasty. Carlism playing a significant role in the Spanish Civil War in the 1930s. The Bourbon dynasty was eventually restored, in a constitutional monarchy, in 1978. There are several monarchist parties in France, most notably the Action Française (established 1899). Monarchist parties also exist in the Czech Republic (1991), in Greece (2010), in Italy (1972) and in Russia (2012). Otto von Habsburg renounced all pretense to the Habsburg titles in 1958, and monarchism in Austria has next to no political influence; a German monarchist organisation called Tradition und Leben has been in existence since 1959. Monarchism in Bavaria has had more significant support, including Franz Josef Strauss, minister-president of Bavaria from 1978–1988. ^ Encarta-encyclopedie Winkler Prins (1993–2002) s.v. "Spanje §5. Geschiedenis". Microsoft Corporation/Het Spectrum. ^ a b De Blois & Van der Spek (2004), p. 71–72. ^ De Blois & Van der Spek (2004), p. 74. ^ De Blois & Van der Spek (2004), p. 86–87. ^ Encarta-encyclopedie Winkler Prins (1993–2002) s.v. "geronten". ^ Encarta-encyclopedie Winkler Prins (1993–2002) s.v. "Romeinse Rijk. §2. Staatsinstellingen". ^ De Blois & Van der Spek (2004), p. 103–106. ^ Encarta-encyclopedie Winkler Prins (1993–2002) s.v. "hellenisme". ^ a b De Blois & Van der Spek (2004), p. 127. ^ Encarta-encyclopedie Winkler Prins (1993–2002) s.v. "Carthago. §1. Geschiedenis". ^ Encarta-encyclopedie Winkler Prins (1993–2002) s.v. "Diocletianus, Gaius Aurelius Valerius." ^ Henri Pirenne, Mohammed and Charlemagne (1937), 46–48. ^ United States Department of State – Under Secretary of State for Public Diplomacy and Public Affairs – Bureau of Public Affairs. "Background Note: Andorra". Retrieved 12 September 2009. ^ european navigator (20 June 2006). "Full list of the results of the referendum on the issue of the monarchy (13 March 1950)". Historical events – 1945–1949 The pioneering phase. Retrieved 28 June 2006. ^ "Republicans plan to cut Mary's reign". The Age. Australia. 12 May 2004. Retrieved 27 June 2006. ^ United States Department of State – Under Secretary of State for Public Diplomacy and Public Affairs – Bureau of Public Affairs. "Background Note: Liechtenstein". Retrieved 12 September 2009. ^ Foreign and Commonwealth Office. "Country Profile: Liechtenstein". Archived from the original on 25 May 2011. Retrieved 25 November 2009. ^ Fayot, Ben (October 2005). "Les quartres référendums du Grand-Duché de Luxembourg" (PDF) (in French). Luxembourg Socialist Workers' Party. Archived from the original (PDF) on 27 September 2007. Retrieved 3 August 2007. ^ United States Department of State – Under Secretary of State for Public Diplomacy and Public Affairs – Bureau of Public Affairs. "Background Note: Monaco". Retrieved 12 September 2009. ^ Berglund, Nina (5 November 2005). "Monarchy losing support". Aftenposten. Archived from the original on 29 May 2006. Retrieved 4 April 2007. ^ "Spain wants to be a Republic, again". Pravda. 1 December 2003. Retrieved 28 June 2006. ^ Angus Reid (14 October 2006). "Spaniards Content with Monarchy". Angus Reid Global Monitor: Polls & Research. Archived from the original on 28 June 2013. Retrieved 14 April 2013. ^ Douwe Keulen, Jan (5 June 2014). "The call for a third Spanish republic". Al Jazeera. Retrieved 16 July 2014. ^ Ipsos MORI (22 April 2006). "Monarchy Trends". Retrieved 27 June 2006. ^ "Where the queen still rules". The Guardian. UK. 7 November 1999. Retrieved 30 June 2006. ^ United States Department of State – Under Secretary of State for Public Diplomacy and Public Affairs – Bureau of Public Affairs. "Background Note: Holy See". Retrieved 12 September 2009. ^ "Overturning centuries of royal rules". BBC. 28 October 2011. Retrieved 29 March 2018. ^ Fordham, Alive (8 November 2005). "War of Spanish succession looms while baby sleeps". The Times. UK. Retrieved 29 June 2006. ^ Tarvainen, Sinikka (26 September 2006). "Royal pregnancy poses political dilemma for Spain". Monsters and Critics. Archived from the original on 14 December 2011. Retrieved 27 September 2006. ^ Angus Reid (21 October 2006). "Spaniards Support Monarchy Amendment". Angus Reid Global Monitor: Polls & Research. Archived from the original on 28 June 2013. Retrieved 14 April 2013. ^ Pancevski, Bojan (19 November 2007). "No princesses: it's men only on this throne". The Times. UK. Retrieved 23 November 2007. ^ "New Ducal succession rights for Grand Duchy". Luxemburger Wort. 21 June 2011. Archived from the original on 19 December 2012. Retrieved 21 June 2011. ^ a b c Herman, Matthijs (2013). "De kosten van een staatshoofd in West-Europa" (PDF). Tijdschrift voor Openbare Financiën (in Dutch). 45 (3): 143–154. ^ Robert Giebels (27 October 2016). "Welk vorstenhuis is het duurste van Europa?". de Volkskrant (in Dutch). Retrieved 28 October 2016. ^ Philip de Witt Wijnen (16 October 2015). "Nederland heeft in Europa het duurste vorstenhuis". NRC Handelsblad (in Dutch). Retrieved 29 October 2016. ^ "As Dutch prepare for new king, republicans ask to abolish monarchy". The Christian Science Monitor. 29 April 2013. Retrieved 29 March 2018. ^ Madrid, Agence France-Presse in (8 June 2014). "Majority in Spain want referendum on future of monarchy". The Guardian. Retrieved 29 March 2018. ^ "Anti-monarchy protests persist in Spain". Al Jazeera. Retrieved 29 March 2018. "CIA – The World Factbook". The World Factbook. Central Intelligence Agency. 11 July 2006. Retrieved 19 July 2006. "World Leaders". World Leaders. Central Intelligence Agency. 18 July 2006. Retrieved 19 July 2006. Louda, Jiří; Maclagan, Michael (1991). Lines of Succession: Heraldry of the Royal Families of Europe. Macmillan. ISBN 978-0-02-897255-8. There are several monarchies in Africa, defined as either actually or nominally self-governing states, territories, or nations on the continent of Africa where supreme power resides with an individual who is recognized as the head of state. All are similar in that the sovereign inherits their office and typically keeps it until their death or until their abdication. However, only three are currently sovereign, while the remaining are sub-national monarchies. Two of these are constitutional monarchies, in which the sovereign is bound by laws and customs in the exercise of his or her powers, and one is an absolute monarchy (Eswatini), in which the sovereign rules without bounds. The sub-national monarchies are not sovereign, and exist within larger political associations. In addition to these, there are also three dependencies of two European monarchies.